The big news today is that first there were two and now there are three. We are walking with Juan Holgado. I met Juan in March, between Los Barrios and Castillo de Castellar, and he became a constant source of advice and guidance for the rest of walk. He has kindly agreed to join us for the rest of the this trip despite the fact that it turns out I have been spelling his name wrong for months (Holgado not Holdago). Juan is an expert in all things walking in Spain so I won't be doing anymore navigation. Another brilliant walk, high up above the valley but today heading east rather than south. Better still we have left the dust vehicle trails which have been standard over the last four days and are walking along ancient Moorish tracks, often parallel with old irrigation canals, which this part of Spain is famous for. 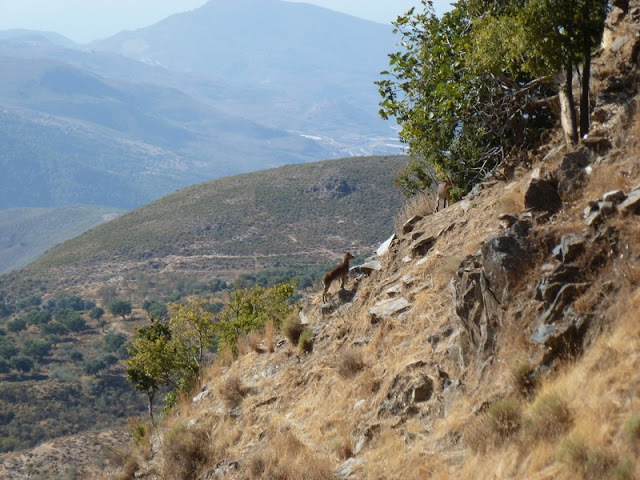 We are now in the Alpujarras and the Sierra Nevada Natural Park, spectacular walking. Climbing up and looking back to Lanjaron we saw the first of a series of towns and villages, all perched up on the side of the mountains, and all white. 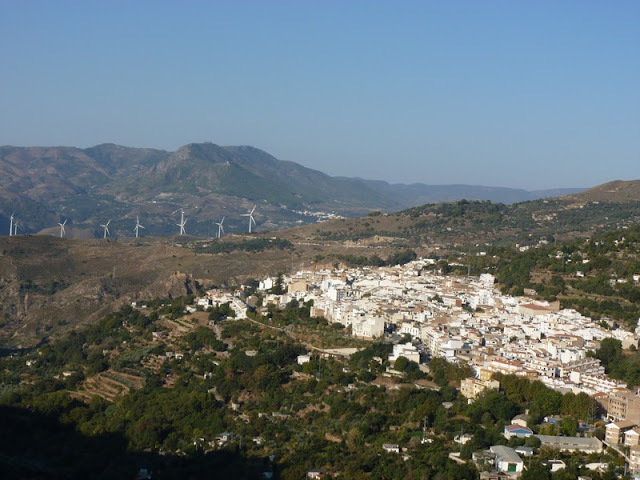 Lanjaron, by far the largest, overlooks for ancient Moorish route from Granada to the coast, its strategic position is crowned with a castle and the designation "gateway to the Alpujarras". 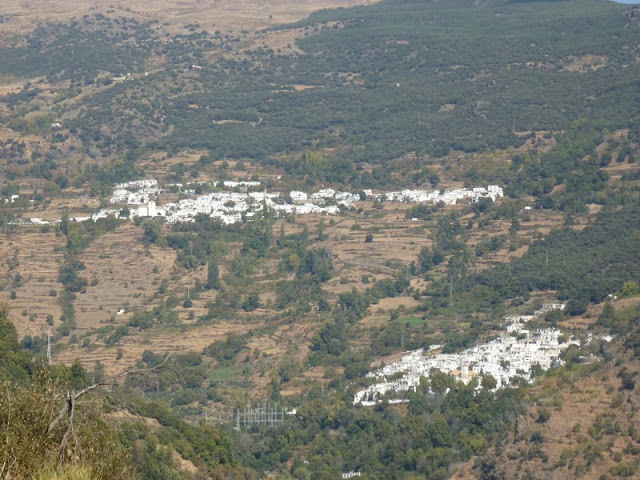 After Lanjaron you visit the villages of Canar, Sopurtujar before the final and perhaps most famous trio of white villages, Pampeneira, Bubion and Capileira (above Bubion but not on the GR7). These tiny, intensely compact villages with their ancient street patterns are lovely but for me the star of the show was the path itself. This is genuine contour walking and contour walking with huge views. For once you don't have to consume huge amounts of energy to see huge amounts of scenery. The trail from Lanjaron was a fairly steep climb up to a col and then a gentle descent through almonds and figs to Canar. From Canar the path countered round the sides of a spectacular valley to Sopurtujar, where we bought fruit juice and sat in the shade for 10minutes. Then we followed an old moorish irrigation channel which meant the path was completely flat but high up the valley side so the views were fantastic. We could see the Mediterranean in the south, and the gorge we walked down 2 days ago in the west. At one point we spotted 3 mountain goats. Then down to cross the valley over a road bridge before the final climb up first to Pampeneira and finally to Bubion, both gorgeous beautifully preserved White villages. Staying in Hostal des Terraces which has wonderful views across the valley. Christine and I stayed here 15 years ago and have good memories. 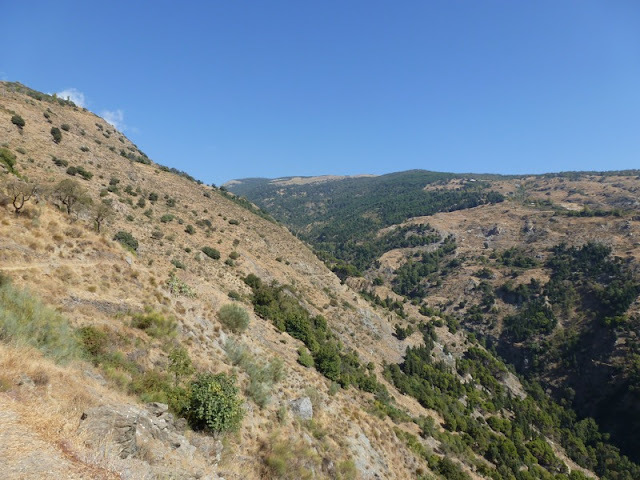 Could you walk from Pampeneira to Capileira and back as a kind of day hike? Thanks so much for your great post.